The much-anticipated Run to Fight Children’s Cancer 5K/10K took place Saturday at GCU, and the outcome couldn’t have been better. 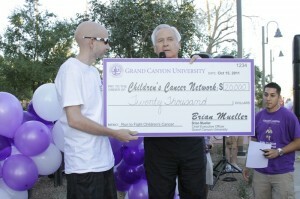 Thanks to sponsors, volunteers, walkers, runners and countless supporters, GCU was able to present a check worth $20,000 to the Children’s Cancer Network, the event’s beneficiary. The inaugural run, in what is hoped to be an annual event, far exceeded expectations. The event, the brainchild of Executive Director of Communications and Public Affairs William Jenkins, was two years in the making. “This has been a dream of mine for a long time,” Jenkins said. “Ever since I was diagnosed with colon cancer and ran in a colon cancer race, I’ve wanted GCU to be able to do something to support the fight against cancer. With sponsors donating enough to cover the expenses, all of the proceeds from registration went to the cause. Patti Luttrell, the founder of the Children’s Cancer Network and an adjunct faculty member at GCU, was impressed. The event was more than just a race. With mascots from all of the professional sports teams and four players from the Arena Football League’s Arizona Rattlers in attendance, as well as a bounce house, face painting, a craft table and a Survivor’s Walk around the intramural fields, the day was a fun-filled affair for the entire community to come out and show its support. This was an awesome event and my first 5k race I have ever done, and I made it the entire way. I will be back next year, and hopefully improve my time.